ICWAI Exam 2019 - CMA Final exam is being conducted by the Institute of Cost Accountants of India. 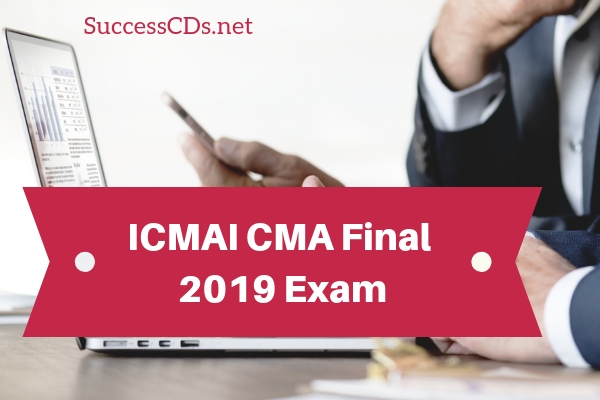 Foundation Course Examination for CMA June 2019 has to be taken by eligible candidates on the date announced by ICMAI (formerly known as ICWAI). The notification for The Institute of Cost Accountants of India ICWAI CMA 2018 has been announced. Application Forms for Intermediate and Final Examination has to be filled up through online only and fees will be accepted through online mode only (including Pay fee Module of IDBI Bank). No Offline form and DD payment will be accepted for domestic candidate. Candidates who have cleared Intermediate Examination of the Institute of Cost Accountants of India will be eligible to take admission in the Final course. A copy of Intermediate Pass Mark Sheet has to be furnished along with the Admission form. Candidates those who have passed a particular group of Final Examination under Syllabus 2012 and are willing to pursue the course under Syllabus 2016, would be eligible for exemption under Syllabus 2016. Cities in India: Adipur-Kachchh (Gujarat), Agartala, Agra, Ahmedabad, Akurdi, Allahabad, Asansol, Aurangabad, Bangalore, Baroda, Berhampur(Ganjam), Bhilai, Bhilwara, Bhopal, Bewar City(Rajasthan), Bhubaneswar, Bilaspur, Bokaro, Calicut, Chandigarh, Chennai, Coimbatore, Cuttack, Dehradun, Delhi, Dhanbad , Duliajan (Assam), Durgapur, Ernakulam, Erode, Faridabad, Ghaziabad, Guntur, Guwahati, Haridwar, Hazaribagh, Howrah, Hyderabad, Indore, Jaipur, Jabalpur, Jalandhar, Jammu, Jamshedpur, Jodhpur, Kalyan, Kannur, Kanpur, Kolhapur, Kolkata, Kota, Kottayam (Malappuram), Lucknow, Ludhiana, Madurai, Mangalore, Mumbai, Mysore, Nagpur, Naihati, Nasik, Nellore, Neyveli, Noida, Palakkad, Panaji (Goa), Patiala, Patna, Pondicherry, Port Blair, Pune, Raipur,Rajahmundry, Ranchi, Rourkela, Salem, Sambalpur, Shillong, Siliguri, Solapur, Srinagar, Surat, Thrissur, Tiruchirappalli,Tirunelveli, Trivandrum, Udaipur, Vapi, Vashi, Vellore, Vijayawada, Vindhyanagar, Waltair. The overseas Centres at Bahrain, Dubai and Muscat. See: What is Chartered Accountancy and what are the career opportunities? Paper20- Strategic Performance Management and Business Valuation. After the successful conduction of exam by the Institute of Cost Accountants Of Indian, Result of CMA Final will be declared. It will be declared online on scheduled date given above.